School’s out – how do we keep the kids busy? The school holidays are here. Each summer I face the same challenge. Home with three kids for two entire months – how will I keep them occupied, entertained or better still, busy?… Teenage daughter will hang out with her friends. The boys, though, are getting old for some of the summer camps and still too young to send off to work (damn!). “When I was young there were no summer camps,” I chide my sons, trying to prod some gratitude for the opportunities they get. However, there was plenty of work, but unpaid! My mother inevitably had home decor and maintenance projects lined up like painting walls, gates, hanging wallpaper, weeding or picking blackcurrants…. It wasn’t all hard graft. Or did I sneak away to quietly read, leaving my older siblings to grapple with wallpaper paste? 1. Climb a tree – our scraggy branches have been well clambered. 2. Roll down a really big hill – they ran, not rolled. 3. Camp out in the wild – not happening unless we turf them out some night with a borrowed tent. 4. Build a den – does hammering a makeshift tree house count, with Daddy-O doing all the work? 6. Run around in the rain – washing machine wear and tear can vouch for this. 10. Play conkers – Ouch, yes. Although Junior might tackle some of these tasks (skim stones, catch fish), his teenage bigger brother is cynically past caring. But if they dare moan about being bored, I’ve a list of painting jobs to keep them busy! 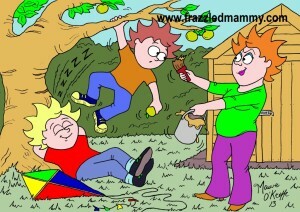 This entry was posted in Parenthood and tagged Cartoonist, Cork, Illustrator, Ireland, Maeve O'Keeffe, Parent on June 28, 2014 by frazzledmammy.